Here are the white radishes that she pulled for me. 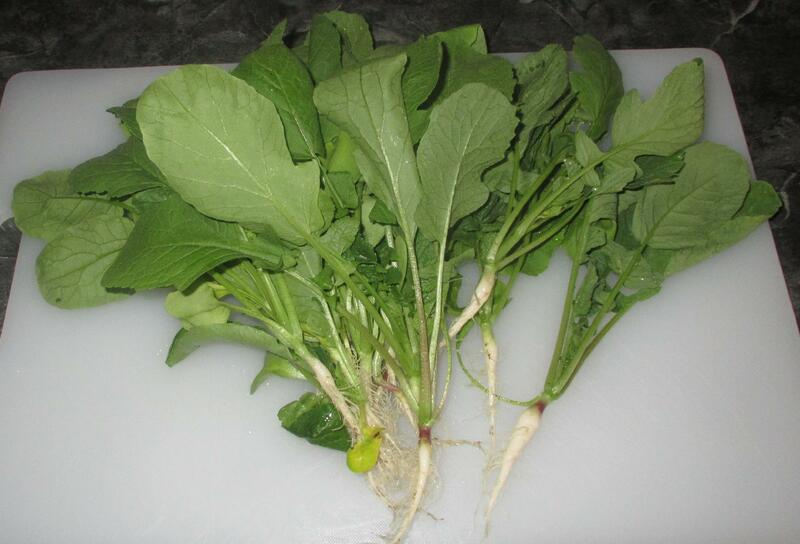 As you can see, the actual radishes are only slightly developed, but it was necessary to thin things out a bit and so, at least, we have some nice greens to work with here. 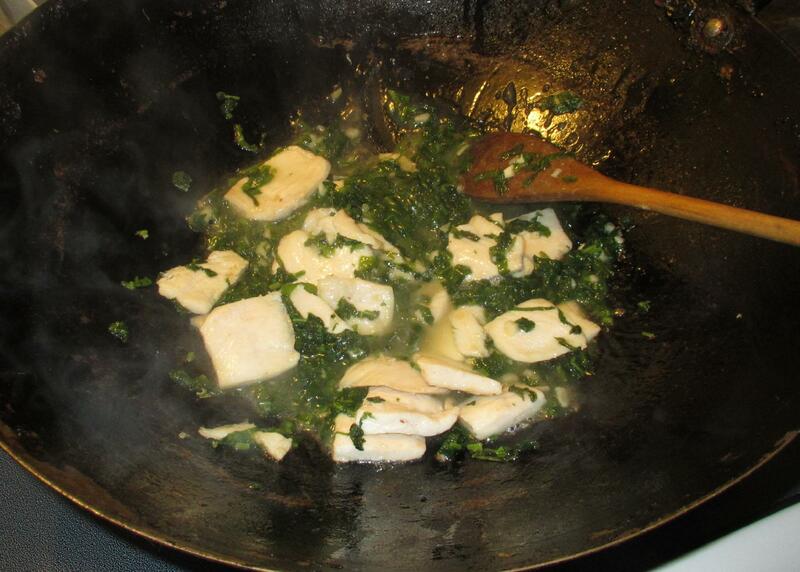 For this dish, I am replacing the chicken stock with wine. 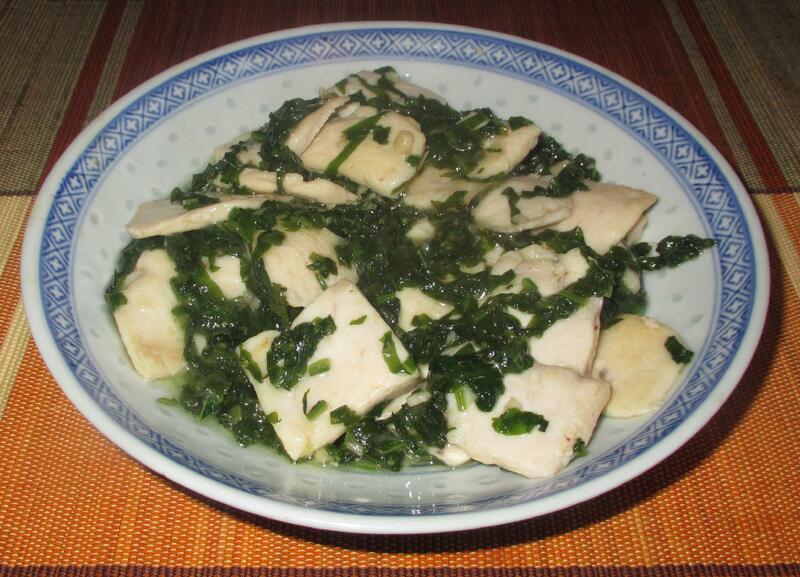 You can use rice wine, if you like, but a nice European dry white wine will work nicely too. 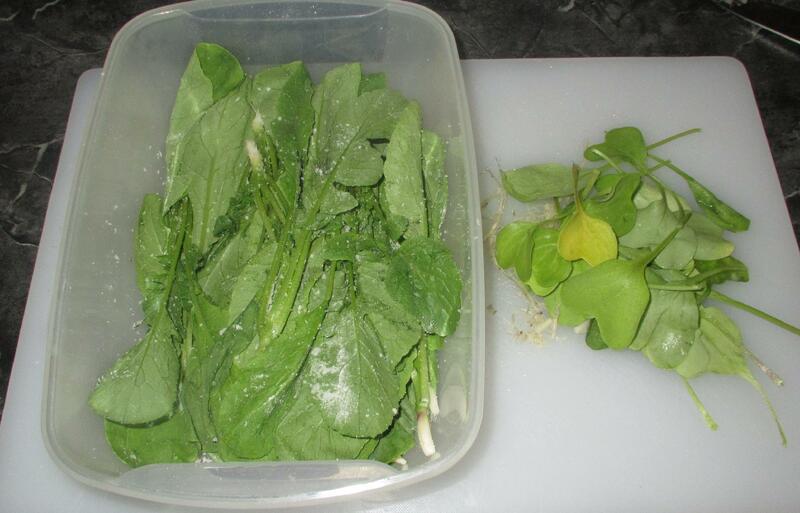 In contrast to the original recipe, which simply chopped fresh watercress, I am going to salt my radish greens and let them sit for two days so that they ferment slightly and produce a nice lactic acid tang. 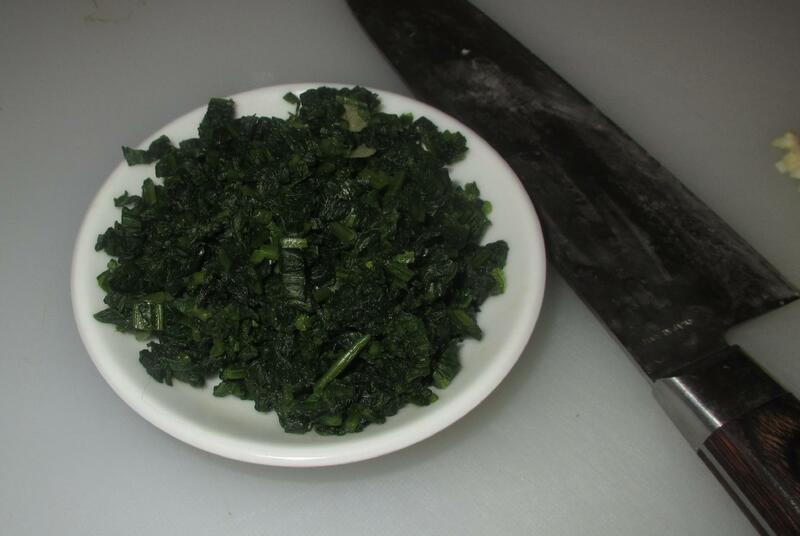 All you need do here is toss the greens with the salt and cover them in a suitable container. Don’t worry about the amount of salt used here; almost all of it will be washed away later. Here are the greens after sitting on the counter top for 48 hours. They are considerable wilted and are just beginning to take on a lightly sour aroma. 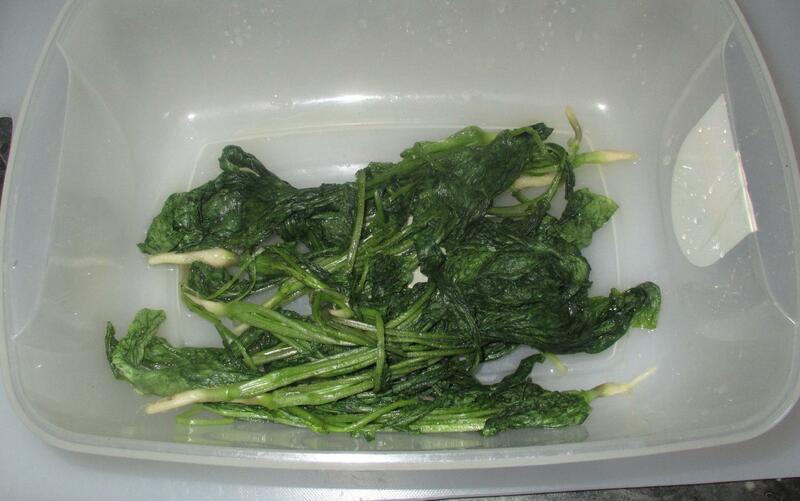 Once the greens are sufficiently pickled, pour away any liquid thrown off by the process and rinse them well with cold water to remove the salt. Next, trim away the thick roots and chop the remaining leaves moderately finely. 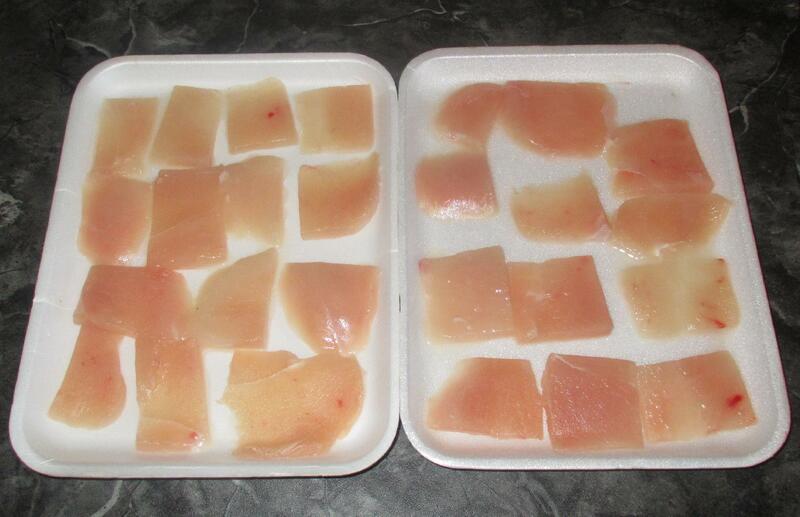 To prepare the chicken, you need to make three or four horizontal slices through the breast (this is easier if you partially freeze it first) and then cut the slices into bite size pieces. For this dish, I am not using the whole breast as I trimmed the thinnest portions of the edges away and used this meat for fried rice in a different meal. When you are ready to cook, mix the cornstarch together with enough water to make a paste and then stir in the wine and the soy sauce. Set this aside for now. 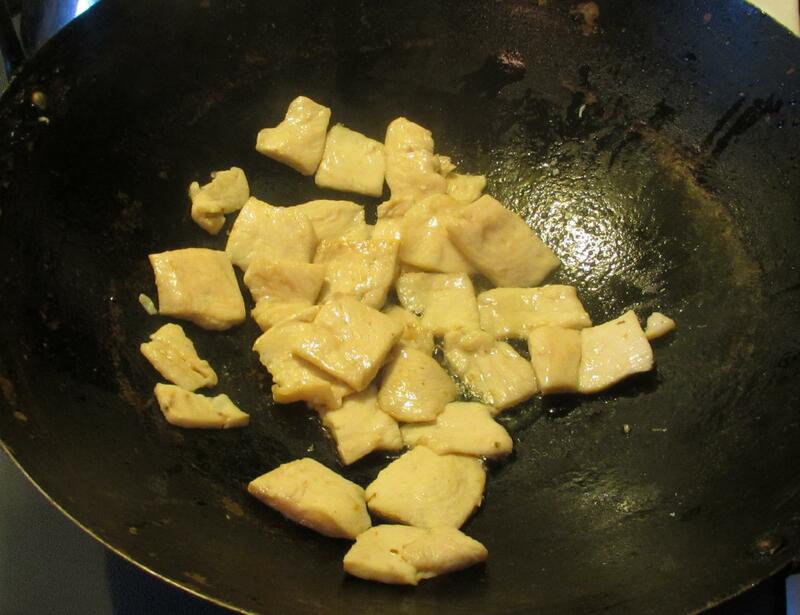 Now, heat a couple of tablespoons of oil in your wok over moderate heat and quickly sauté the chicken pieces until they have just turned opaque but are still a little pink in the center Remove to a bowl for the moment. 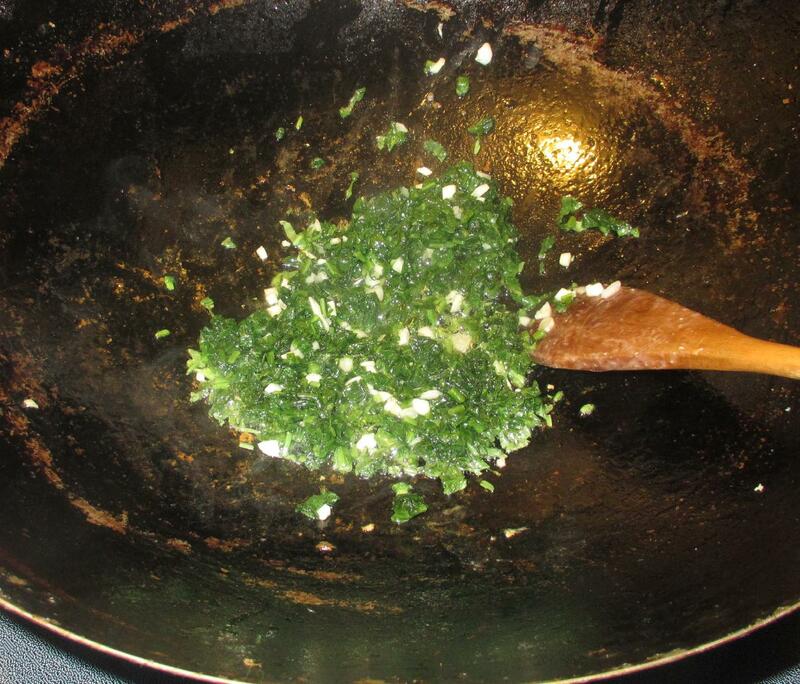 Replenish the oil if necessary and then briefly fry the garlic until it gives off its aroma. Add the greens and toss for a few minutes to brighten and drive of a little more water. Thai Food Comes to Iqaluit!